This is a very easy appetizer. It only requires three ingredients, Brie, a package of crescent rolls and jam. On the Tenth day of Christmas my true love made me…. Today was the first day of Christmas vacation for our family. We spent it watching Christmas movies and eating Christmas Popcorn. Tomorrow will be more of the same. I made air popped popcorn with butter and salt, melted chocolate chips and butter in the microwave. I spread the popcorn on a cookie sheet, mixed in pretzels, plain and peanut M&M’s and drizzled on the melted chocolate. When I moved across the country 11 years ago, we were broke. We had just moved in October and I started a new job in the middle of November. We were living in a one bedroom furnished basement apartment. We didn’t have Christmas decorations, and couldn’t afford a Christmas tree. We bought a string of lights for the tree that came with our furnished apartment, and decorated it with paper cranes. It was simple festive and inexpensive. 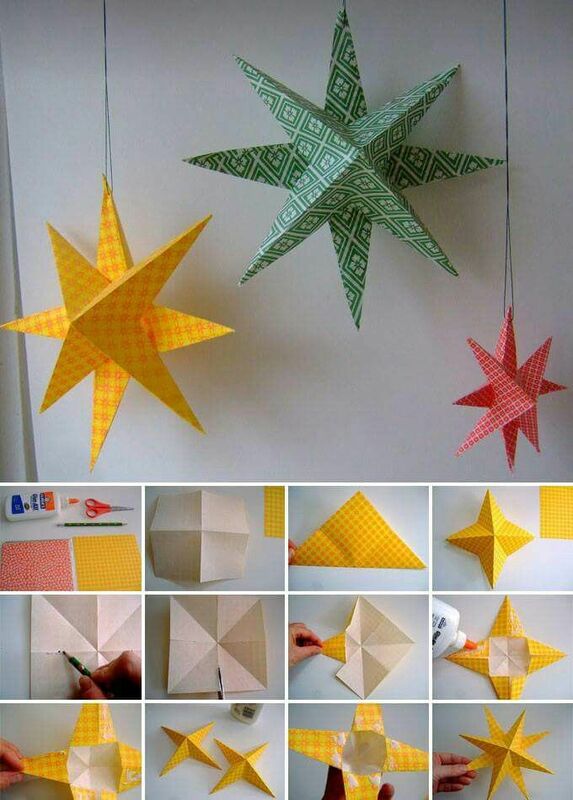 These stars are in line with the cost of the paper cranes from our first Christmas. I bought a book with 100 sheets of patterned paper for $7.00 and the ribbon at the dollar store for $2.50 (2 spools with 5 colours each). You also need a glue stick which I borrowed from my son, and a glue gun which I had. With many hours of binge watching labour you can make 100 ornaments for $9.50. For instructions there is a visual tutorial here. This project started with a trip to Michaels’s with my six year old shadow. He saw the yarn with the pom pom’s attached and it was too soft to walk away from. I bought three balls of yarn, one for him, and one for each of his young cousins. Then my older son wanted one, then I asked my other sister if her kids would like hats. The next thing you know I was making a range of hats to fit 6 months to 13 years old. I knit 8 hats in total in a variety of different colours for all of my nephews, my kids and my single niece. I can’t wait to see the pictures of all of them in their new toques. But first I have to take a trip to the schools lost and found to see if I can’t find one of my kids hats. It’s been 8 days and it’s missing already!